Most Significant Bit (MSB) - Also known as the high order bit. These are the left-most bit, or bits. A great example that the book uses is that in a PS-Poll frame, the Duration/ID field carries either the Duration, or the AID (association identifier.) If the MSB's are set to 11 then the following bits represent the AID. If the single MSB is set to 0 then the following bits will be the duration of the frame. Least Significant Bit (LSB) - This is the right most bit since its (normally) going to be in the furthest right position. Fun factoid the book points out that I never realized in my years of binary. This is the bit that determines if the value will be even or odd… don't know how I never realized that before. Most Significant Bit First (MSBF) - Pretty straightforward, when receiving the MSB will come in first and the LSB will be last. Preamble - Just because a frame is getting sent on the wire doesn’t mean that it doesn’t need a preamble. This is to alert the receiving device that a frame is incoming and to synchronize it so that the timing is… well, synchronized. 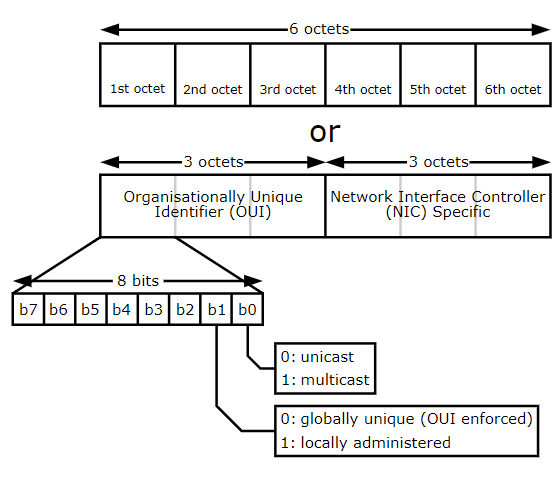 The ethernet preamble is 7 repeating octets of 10101010 - This is how they would be received, which, remember is Least Significant Bit First, so the first bit is actually the left-most bit. SFD - The SFD comes right after the Preamble is a single octet that’s 10101011. The pattern might look vaguely similar, and its because its basically the same as the preamble pattern, only with its MSB being a 1 rather than a 0. This 11 pattern rather than the preambles 10, tells the receiver that the MAC frame is incoming. These bits are the two LSB's in the first octet of the MAC address (U/L = b1 and I/G = b0). 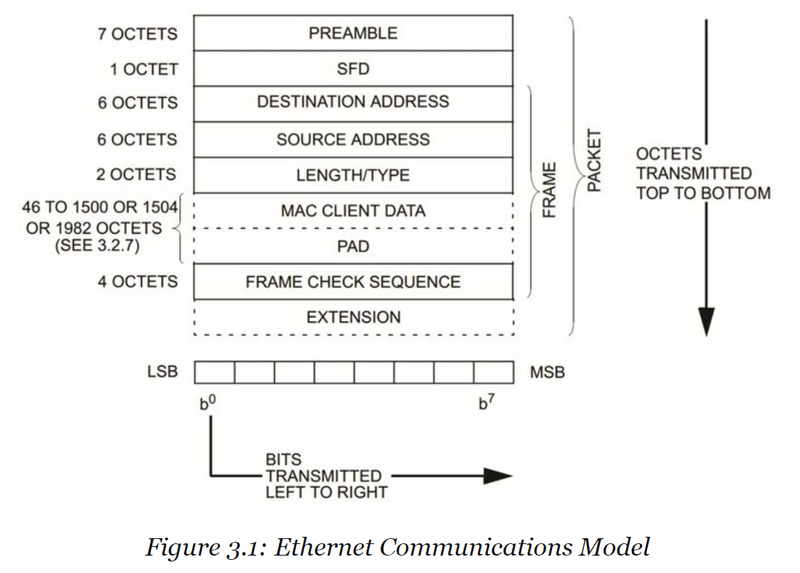 So when you are looking at a MAC address they are the two right most bits in the first octet which his in the OUI section. Broadcast address consists of the 46-bit address being made up of all ones. Data Field - This is the actual payload from the upper layers. The maximum payload size is 1500 bytes, however you will see 1518 bytes noted, but this is including the DA/SA, Length/Type, and FCS fields, which all add up to 18 bytes. FCS - This is used to check the integrity of the frame. It contains a cyclic redundancy check value. Its important to note that the CRC bits in the FCS field (say that 5 times fast) are actually transmitted with the MSB first. 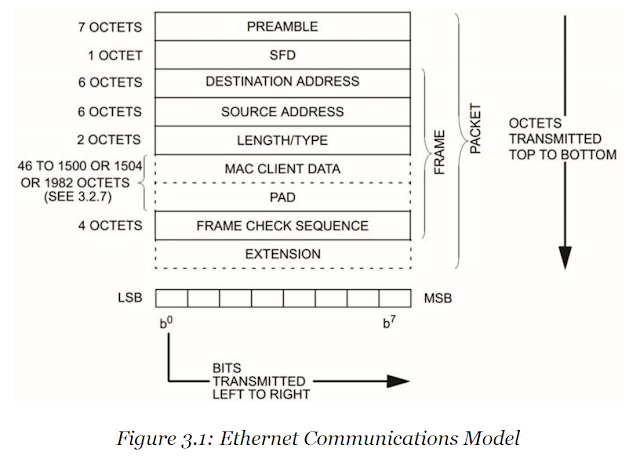 Which is different from the rest of the ethernet frame which is transmitted with the LSB first and ending with the MSB. Extension - This field is used when the frame would be less than a full slot time in the PHY being used. Essentially it adds padding to ensure that a frame fills a slot time. Split MAC Model - This architecture requires a controller to handle many of the MAC layer operations. This is why its often called a "Centralized" Model. Because much of the traffic is send back to a "central" controller. As noted above, AP's in this model are often called "thin" AP's. Some may go as far as to say they are "dumb" AP's. But I don't condone bullying. 802.11e brought with it two new types of STA's - QoS Access Points and QoS Stations. These are pretty straightforward. Basically what it means is that they are AP's or STA's that can support QoS, but can and will act as a normal (non-QoS) AP or STA if they need to. EDCAF - Enhanced Distributed Channel Access Function - 802.11e brought with it an enhancement to DCF to allow for certain priority levels to be applied to certain types of traffic. This allows traffic with a higher priority to be able to take control of the medium before traffic of a lower priority. It doesn't guarantee it, but it makes it more probable. EDCAF has eight traffic categories, each with a User Priority (UP) from 0 to 7. The Wi-Fi Alliance decided at some point that they needed to make a certification before the 802.11e standard was fully ratified. So they created the Wireless Multimedia (WMM) certification which was based on the draft version of 802.11e. It is currently in use for VoWiFi devices. So let's put this whole thing into a story using some of the metaphors I alluded to in the previous entry regarding State Machine. Imagine if you will, there is a client device. Let's call him Stan (get it? STAn? Nothing? Well anyway…) Stan is walking down the street looking for a place to eat dinner. In this world the restaurants all have a person outside yelling the name of the restaurant and its specialties. (This is the AP's beaconing) Stan hears a restaurant name that he thinks sounds delicious and walks up. The person outside the restaurant asks him what the password is. But poor Stan doesn't know it. So he meanders along. He turns the corner and doesn't hear anyone yelling restaurant names for a minute. So he decides to yell out and ask if any are out there (Active Probing) all of a sudden he's bombarded with restaurants who are answering his call for food. He chooses the one closest to him and walks up to the doorman outside. The doorman says to him that this isn't one of those hoity-toity restaurants that requires a passcode and probably limits the amount of food you can eat. This is a public place, so come in and have your fill. (Open System Authentication) So Stan is allowed (authenticated) into the restaurant. Inside the foyer of the restaurant there is a host who makes sure that Stan meets the bare minimum criteria of eating there. This is an old place with very old and basic requirements, and Stan being a younger up-to-date person easily meets them. The host then allows him on through to the inside of the restaurant. Upon walking through the door, Stan not only feels like he has been Authenticated, but he feels like he has a place he is truly associated to. "State Machine" would be a great name for a punk band don’t you think? 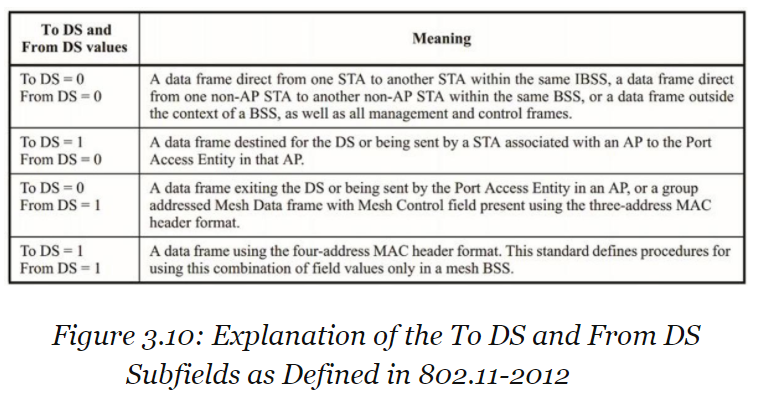 The first state, Unauthenticated/Unassociated basically means that the STA is not connected to the WLAN. Any frames sent are not passed on through the AP. The second state, Authenticated/Unassociated is a rarely seen one. Essentially the client device has already given the doorman the secret handshake and shown him their membership ring and at this point is allowed into the foyer. Normally they are passed quickly through to the next state. However there are times when the AP may be at capacity or some other issue may arise where although they are Authenticated, they are not allowed entrance. At this point they are normally kicked back out to the Unauthenticated state. The third state Authenticated/Associated means the client has made it past the foyer and has made their way into the wondrous world of the LAN. Association Response Frame - When the AP sends the association response frame to the client it includes a status code. This is kind of like a college acceptance letter. You know you are going to get a letter of some kind back from the college, but you aren't sure what will be inside. If the status code is a 0 then you're association request was successful, or to further metaphor you were accepted to the college! Congratulations! There are a couple other status codes that indicate that you unfortunately didn’t make the cut for a number of reasons. If it’s a 12, then its something outside the standard. Maybe the admissions persons dog ate your application or something. If it’s a 17, that means that the AP is full and is serving the maximum number of STA's. Basically the college would love to accept you, but the fire warden says that they are full. If its an 18 though… an 18 means that the STA does not support all of the basic rates that the BSS requires. To continue with our metaphor, your SAT scores were too low. Station (STA) - Any 802.11 wireless addressable unit. This could be a client station *or* an AP. 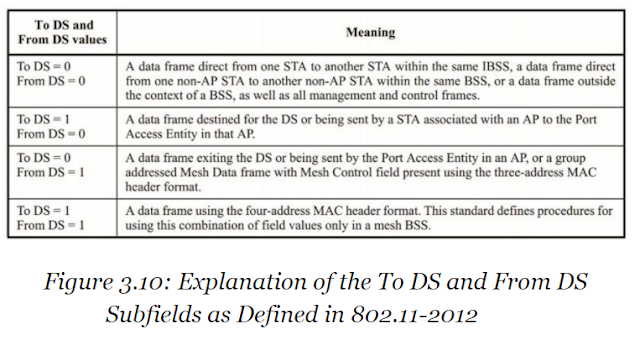 Basic Service Set (BSS) - The basic building block of an 802.11 wireless network. Composed of at least one Station (STA) that has initiated a service set, and possibly more stations have joined that service set. A BSS is usually initiated by an AP and then joined by client stations. Basic Service Area (BSA) - The area containing the members of a Basic Service Set (BSS). It may contain members of other BSSs. Basic Service Set Identifier (BSSID) - The 6-12 octet (12 hex characters) MAC address representation that identifies a BSS. A single AP's radio can support multiple BSSs using a unique BSSID for each. Independent Basic Service Set (IBSS) - A Basic Service Set (BSS) that forms a self-contained network, and in which no access to a distribution system (DS) is available. IBSS networks also lack a central coordination point, such as an AP. An IBSS is also often called an Ad Hoc or Peer-to-Peer network. Distribution System (DS) - A system used to connect LANs and BSSs to create an ESS. This is normally the ethernet network of the company. Distribution System Medium (DSM) - The medium used to communicate between APs and portals of an ESS. Service Set Identifier (SSID) - The network name of a BSS or ESS as known and identified by users. To connect to an AP, you first must find it. To do so, there is a discovery process that needs to take place. Like many things, you can actively look for them, or you can just sort of… find them… passively. When STA's actively look for SSID's they send out Probe Requests. These probe requests can specify the SSID that they are looking for, or look for any BSS that is able to hear the request and will answer. Basically "Hey Frank, you there?" versus " Is there anybody out there?" AP's that hear these requests respond with probe response frames. These are essentially beacon frames, containing almost all of the same information except for the TIM element. If an AP hears a request with a wildcard SSID, it will respond with a probe response containing all of its SSIDs. There are a couple of important things to note here. Often, a STA will be within "hearing-range" of multiple AP's. So if that STA sends out a probe request *all* of the AP's that can hear it will respond. Also important to remember is that your AP's are all going to be on different, non-overlapping channels. (Right?!?) So to be able to find those AP's the STA will have to broadcast its probe request on all channels its configured to use. However even this is a little bit of an oversimplification. The actual process looks more like this. 2.) It starts a ProbeDelay countdown timer, while this is ticking by it is listening for an incoming frame. 4.) Wait for the MinChannelTime to pass - If the medium was never busy and nothing responds, then there is no WLAN on the channel and it can move to the next channel and start its search over again. However if the medium was in fact busy at some point it will wait until the MaxChannelTime expires and then will look at any probe response frames that have come in. Remember that Beacons are sent from AP's in regular intervals. So in order to find AP's all a STA needs to do is sit there and listen for beacons to find AP's to connect to. If it hears multiple beacons it will parse through them to determine the AP with the strongest signal and start the authentication and association process.